Probably the artist's sale; Christie's, London, 2 March 1876, lot 128 (39 gns. to Maclean). C.J.H. Tower by 1884; his sale; Christie's, London, 1 June 1917, lot 18 (38 gns. to Sampson). Anon. sale; Christie's, London, 21 March 1989, lot 144, (£4,180 to the present owner). W. Armstrong, Memoir of Peter de Wint, 1888, pl. 11 as 'Clifden from Maidenhead Bridge'. 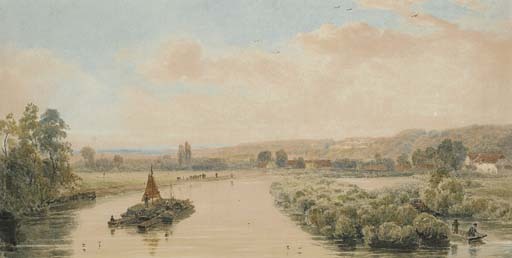 Probably Society of Painters in Water-Colour, 1814, no. 254 as 'View of Taplow from Maidenhead Bridge'. London, J. and W. Vokins, Peter de Wint Centenary Exhibition, 1884, no. 28.